​Phoenix, Ariz. – “Guy Talk” with Coach Kevin Guy is back for another season and will once again take place at Majerle’s Sports Grill in Chandler beginning on Wednesday February 20th. The show will also be extended to one hour, running from 5:30 p.m. to 6:30 p.m. Arizona time, and will be broadcast live on NBC Sports Radio 1060 AM. KDUS – AM 1060 is an NBC Sports Radio and SB Nation Radio affiliate. The show will once again feature the General Manager / Head Coach Kevin Guy, but will now be hosted by Dave "Rooster" Bierstein. Players and assistant coaches may also be showcased. Several of the Arizona Sidewinders will also be in attendance. Fans can also tune in to NBC Sports Radio 1060 AM at 4:25 p.m. every Wednesday prior to the show as the Head Coach will call in to “Roc and Manuch” and give a sneak peek. Coach Guy is the winningest head coach in Arizona Rattlers history and will be entering his 11th season with the team. The show gives fans an opportunity to hear his perspective on the day-to-day of coaching the Rattlers, along with the chance to get to know many of the players. All Arizona Rattlers fans are encouraged to attend may have opportunities to interact with the coach and players after the show. PHOENIX, Ariz. – January 2, 2019 – Hubbard Radio Phoenix owned, KDUS – AM 1060 welcomes the return of Calling All Sports with Roc and Manuch beginning January 2, 2019. Calling All Sports, hosted by Mike Muraco and Dan Manucci enjoyed a 14-year tenure on AM 1060 from 2002 to 2016. The sports talk show will return on AM 1060 in 2019 in the 2 p.m. to 5:30 p.m. time-slot. “The KDUS team is excited to have the duo of Roc and Manuch back on AM 1060 with an expansive show that will strengthen local drive-time sports content for the Valley of the Sun,” Kayla Mortellaro, KDUS Operations Coordinator said. “Roc” as Muraco is referred to on-air, has over 30 years’ experience in the sports industry specializing in marketing, media and public relations. His past sports stops include the Indianapolis Colts, NFL Properties, Arizona Fall League, Phoenix Firebirds, Oakland A’s and the University of Pennsylvania. Roc has been an on-air sports host since 1997, debuting on KHEP NBC 1280AM. Manucci, who goes by “Manuch” on the air, is a former NFL quarterback having been drafted by the Buffalo Bills in the fifth round in 1979 and played for the Bills from 1979-80 and again in 1987. Manucci had stops along the way with the Toronto Argonauts and the Arizona Wranglers. 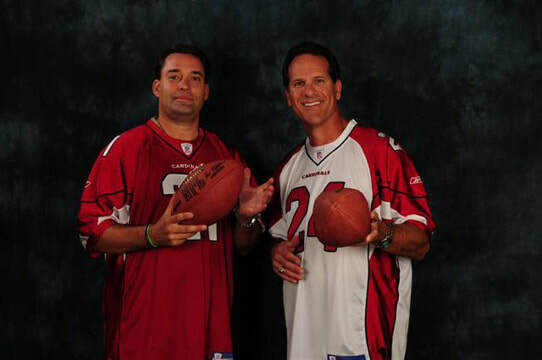 Manuch has TV and radio experience with the Cardinals, Sun Devils, Rattlers and High School Football. In addition, the energetic and entertaining sports show, Calling All Sports, bolstered by Roc and Manuch’s oddball relationship will be nationally syndicated through SB Nation Radio Monday-Friday 4pm-7pm EST. KDUS - AM 1060 is an NBC Sports Radio and SB Nation Radio affiliate as well as carries The Rich Eisen Show. KDUS – AM 1060 is the home for ASU Women’s Basketball, ASU Baseball, NAU Football and NAU Men’s Basketball. In addition, KDUS will partner with the Arizona Hotshots for its inaugural season. KDUS – AM 1060 is also transmitted on 100.7 KSLX HD 2. Hubbard Radio Phoenix owns and operates KUPD 97.9, KSLX, 100.7, KDKB 93.3, KAZG 92.7 and KDUS AM 1060. December 27, 2018. Houston, TX SB Nation Radio is ready to roll out some exciting lineup changes for 2019! Calling All Sports with Roc, Manuch will occupy the 4pm - 7pm ET daypart. The hosts have a loyal following and been a great success in Arizona for over 14 years. It will originate from the newest SB Nation Radio affiliate, KDUS, 1060 AM in Phoenix. “We are ecstatic to bring our show to SB Nation Radio,” said host Mike Muraco (Roc). “This is the perfect opportunity to share our views and opinions and take sportstainment to a national platform.” SB Nation Radio is set to add over 25 new affiliates in January! Matt Perrault will continue to host Pushing the Odds live from Las Vegas. Beginning in 2019, the show will air locally on 920 AM, KBAD. Among the other changes, Jake Asman will host a nightly program called The Power Hour from 7-8pm ET. And a familiar voice will be changing networks. Dave Smith will air his unique style of sports talk on weekends beginning in January. Based in Houston, Gow Media, L.L.C. distributes audio content, reaching an estimated 6.5 million people each week on a network of over 500 terrestrial radio stations, Sirius Satellite Radio, mobile and digital partners. Formerly operating under the Yahoo! Sports Radio brand name, Gow Media, L.L.C. also owns two sports talk radio stations in Houston. Gow Media, L.L.C. is backed by a private investment group with significant experience in media ownership. The investor group includes Steve Webster, co-manager and co-CEO of Avista Capital, Patrick Dugan, vice president and general counsel of Nortex Corporation and David Gow, chairman and CEO of Gow Media, L.L.C.